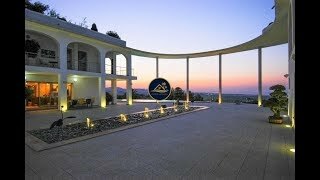 This Luxury Modern Mansion, located in a unique and unsurpassed enclave Presented by your Luxury Estate COSTA HOUSES · Real Estate in Javea (Costa Blanca) is distinguished by its architectural style, executed with great skill. Design, exclusivity, confidentiality are adjectives that define it to perfection. A magnificent view that allows you to enjoy the valley, the mountains and the Mediterranean Sea. Built on a high point, on a comfortable plot of 12,000 m2, you can enjoy the best views, and in a few minutes you can reach the beach. The property is divided into 2 floors, with an area of more than 2.000 m2 and a large central courtyard with fountains. Among the most important details are two large rooms with direct access to the street, several elegant terraces and recreation areas, a well-groomed dining room, a modern kitchen, a spa with indoor pool, a sauna, a Turkish bath, etc. There are 9 bedrooms, all with a bathroom suite, including the Master bedroom, with a large dressing room. One of the “wings” of the building is dedicated to guests, where they have their own kitchen and living room. 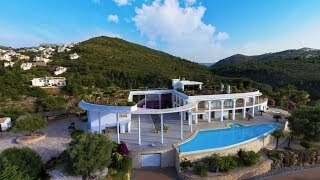 To improve all the amenities, it includes a professional cinema, a billiard room and an impressive water slide of 200 m2 depth with stunning views in combination with a beautiful jacuzzi. All with heating. The roof will surprise us with a large Zen-style garden that surrounds the highest building space, an impressive glazed office. All external spaces were taken into account in the smallest detail. Swimming pool, Jacuzzi, large summer kitchen with stone oven, fountains and gardens will please your rest. Of course, there is a modern house automation system, an elevator, underfloor heating, fountains, a large garage with a car wash with space for 10 cars and a wonderful wine cellar. Distance to the sea 4.5 Km.